Our double queen motel rooms overlook the catch and release pond. They offer Tonto National Forest mountainous backdrop views where you can enjoy our resident fowl while relaxing on your shaded patio. Outdoor Adirondack chairs welcome you to relax and take in the amazing Arizona sunsets and sun rises. Rooms with Shower/Bath Combinations: 1, 5, 6, 9, 10, 14, and 15. Rooms with Shower only: 2, 3, 4, 7, 8, 11, 12, 16, and 18. All rooms are well appointed with toiletries, linens, coffee makers, refrigerators, microwaves, bottled water, and hair dryers. Don't forget to bring your best buddy - we are dog friendly! The dog fee is $20 per dog per stay plus a refundable $100 deposit. Each room offers a covered patio with Adirondack chairs for your relaxation. 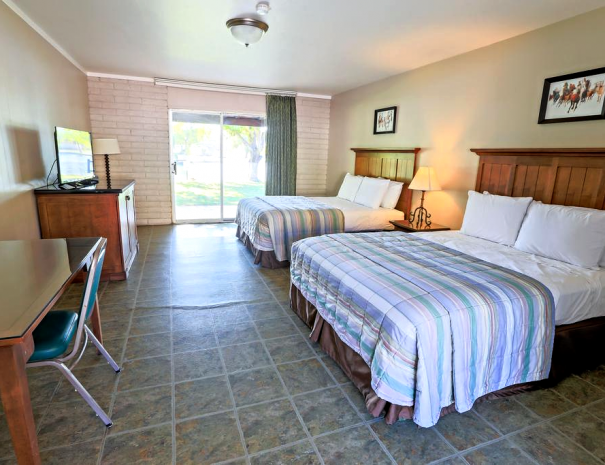 Our Double Queen Rooms near Tonto National Forest sleep 4 comfortably and offer the following hotel amenities: Coffee maker, mini refrigerator, microwave, DirecTV, toiletries, fresh linens and daily housekeeping. We are ATV Friendly and are surrounded by popular Tonto National Forest ATV trails. Right in the middle of Tonto National Forest, you will find hiking trails for all skill levels. What can we say? Every twist and turn brings another breathtaking view.